On February 4th, Anchor Bay Entertainment releases the unforgettable documentary McConkey on DVD. This Official Selection at the Tribeca Film Festival is a tribute to the uncompromising life of pro skier and extreme sport legend Shane McConkey. The film is a bird's-eye view of superhuman achievements by this skier turned BASE jumper, but more than just a compilation of his daredevil greatness, the film is a loving glimpse into the man behind the exhilarating feats with deeply moving reminiscences from family and friends. McConkey is a heartfelt examination of the legacy one athlete left to the progression of his sports, and the path he paved to conquer his dreams. McConkey is revered as a pioneer of free-skiing and ski-BASE jumping, and through his talent and ability to use his trademark irreverent humor, he inspired countless lives. In this film from Red Bull Media House in association with Matchstick Productions, McConkey celebrates the life of one of the world's ultimate innovators. The New York Times says McConkey is "not about why he was such a thrill-seeking risk-taker but about appreciating his success in living life on his own terms." 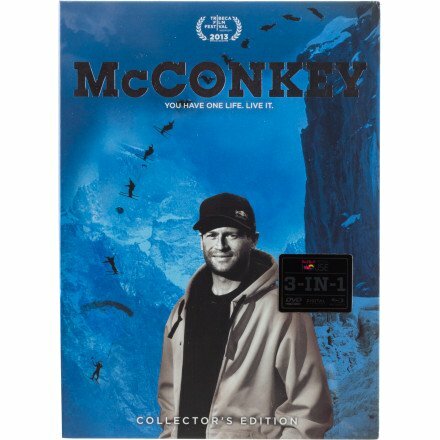 McConkey will touch your heart and leave you breathless, what's even more amazing - it's all true.